April 13, 1918: Municipal Journalarticle. Reconstructing Water Plant Without Interrupting Service. “Fort Madison, Iowa, Replaces Old Pumps, Boilers and Buildings with New, One Item at a Time—Also Builds Storage Reservoir and Filtration Plant, and New River Intake. The building of a new water works plant on the exact site of an old plant, and entirely removing every vestige of material and equipment of the old plant and replacing it with new and without interruption of service, calls for an unusually close study of the engineering features and a careful handling of the construction work and material. It is not an unusual thing to replace an old steel bridge with a new one without interfering with traffic, but in bridge work you at least have a few minutes interval between trains; but in supplying a community of fifteen thousand people with continuous water service, a single interruption, even for a minute, not only jeopardizes the property of the city, but the safety of the citizens as well. Many municipalities and water companies hesitate about carrying out improvements because of the fear of interruption of service and the criticism that this interruption might bring. However, in the case of the Fort Madison, Iowa, water works, criticism had already reached an alarming stage because of the quality of the water and insufficiency of the fire pressure, and it became incumbent upon the city to provide a more satisfactory water and a better fire service. The city was without bond power to provide for a municipal plant, consequently twenty-five of the leading citizens organized the “Citizens’ Corporation,” which was granted a franchise, and they immediately took over the old property and began the reconstruction of the entire water works plant, involving an expenditure of about three hundred thousand dollars. The criticism and suspicion arising from the operation of the old plant was a lesson which caused the new corporation to exert every effort to avoid the errors of the past and to rescue, if possible, an unprofitable business and to adopt measures of economy and efficiency that would make the new project profitable. The consulting engineers, in preparing the plans and specifications for machinery and equipment for the .pumping plant, power plant and filtration system kept in mind the previous unprofitable business and exerted every effort to provide an equipment that would not only give the very best of service but do this at a minimum of expense. Reference: “Reconstructing Water Plant Without Interrupting Service.” 1918. Municipal Journalarticle 44:15(April 13, 1918): 293. This entry was posted in Year 7 TDIWH and tagged drinking water, Fort Madison, Iowa, public health, replacement, water, water history, water treatment on April 13, 2019 by safedrinkingwaterdotcom. April 13, 1918: Municipal Journal article. Reconstructing Water Plant Without Interrupting Service. “Fort Madison, Iowa, Replaces Old Pumps, Boilers and Buildings with New, One Item at a Time—Also Builds Storage Reservoir and Filtration Plant, and New River Intake. The building of a new water works plant on the exact site of an old plant, and entirely removing every vestige of material and equipment of the old plant and replacing it with new and without interruption of service, calls for an unusually close study of the engineering features and a careful handling of the construction work and material. It is not an unusual thing to replace an old steel bridge with a new one without interfering with traffic, but in bridge work you at least have a few minutes interval between trains; but in supplying a community of fifteen thousand people with continuous water service, a single interruption, even for a minute, not only jeopardizes the property of the city, but the safety of the citizens as well. Reference: “Reconstructing Water Plant Without Interrupting Service.” 1918. Municipal Journal article 44:15(April 13, 1918): 293. This entry was posted in Year 6 TDIWH and tagged drinking water, Fort Madison, Iowa, public health, replacement, water, water history, water treatment on April 13, 2018 by safedrinkingwaterdotcom. This entry was posted in Year 5 TDIWH and tagged drinking water, Fort Madison, Iowa, public health, replacement, water, water history, water treatment on April 13, 2017 by safedrinkingwaterdotcom. This entry was posted in Year 4 TDIWH and tagged drinking water, Fort Madison, Iowa, public health, replacement, water, water history, water treatment on April 13, 2016 by safedrinkingwaterdotcom. This entry was posted in Year 3 TDIWH and tagged drinking water, Fort Madison, Iowa, public health, replacement, water, water history, water treatment on April 13, 2015 by safedrinkingwaterdotcom. 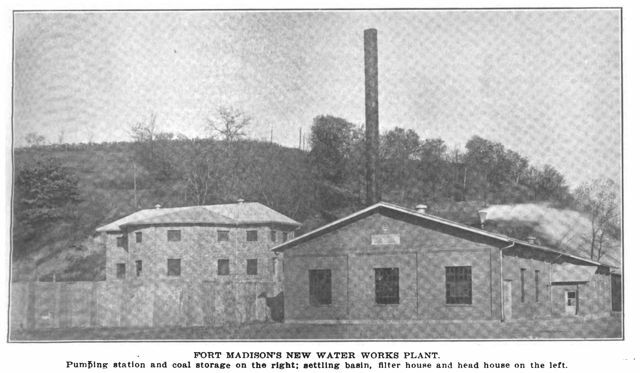 This entry was posted in Year 2 This Day in Water History and tagged drinking water, Fort Madison, Iowa, public health, replacement, water, water history, water treatment on April 13, 2014 by safedrinkingwaterdotcom. This entry was posted in This Day in Water History and tagged drinking water, Fort Madison, Iowa, public health, replacement, water, water history, water treatment on April 12, 2013 by safedrinkingwaterdotcom.